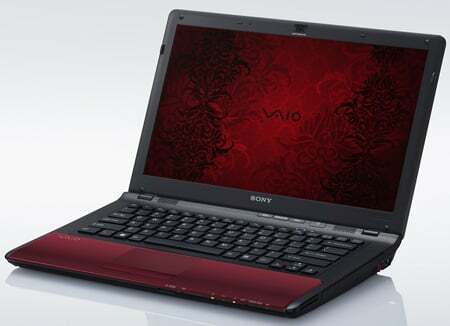 Review Sony’s Vaio laptops aren’t perhaps best-known for their good value, but with an Intel Core 2 Duo P7450, Nvidia GeForce 230M graphics and a £699 price tag, this latest model seems to buck the trend. Part of the CW series, the VPCCW1S1E might not have the most attractive of names, but it’s not a bad looking piece of kit. We had the red model in for test and if red doesn’t do it for you, it’s also available in white, blue, black and even pink. Tipping our scales at 2.3kg and measuring 4cm thick, it's neither bulky nor hugely portable. Add the power adapter into the mix and the overall weight rises to 2.7kg. Overall build quality is good, with a sturdy hinge holding the 14in screen in place, but we were dismayed to hear the battery had a slight rattle when the laptop was first picked up. After closer investigation, it clearly wasn’t in any danger of falling out, but it’s not as snug a fit as we’d like to see, and no one wants their laptop to rattle when carrying it around. When we quizzed Sony about this, it said it hadn’t experienced the problem with any other samples in the series. Power and Gigabit Lan ports sit at the rear, while the front is home to a Wi-Fi power switch and separate SD and Memory Stick card readers. It’s one of the few laptops we’ve seen recently to have a mini-FireWire port (or i.LINK, as Sony calls it), which is found on the left side along with HDMI, VGA and two USB ports. Over on the right, you get a further USB port, a 34mm ExpressCard slot and a DVD burner. It’s worth pointing out that, at the time of writing, the Sony Style website was offering a free Blu-ray upgrade. A large vent is placed on the left side of the chassis and, during testing, the built-in fan only reached an audible level when running our benchmarks. We’re also pleased to report there weren’t any noticeable hot spots. 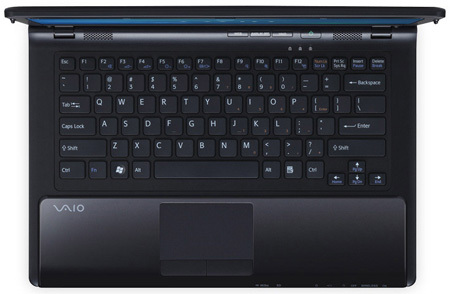 Sony’s gone for its usual Vaio chiclet-style design for the keyboard, and thanks to the keys feeling solid and having a decent amount of space between them it’s great to type on. It also exhibits very little flexing, which is always good to see. Due to the small chassis, though, the arrow keys have been squished to half-height, which makes them fiddly to use.